Android O is going to have a lot of neat stuff, including notification channels for more granular control over what apps can ping you about. However, developers need to get their apps ready by targeting Android O. Until that happens, notification controls will be hobbled in Android O, and Google won't be fixing this apparent problem. There's a thread in the dev preview issue tracker that explains the problem in detail. Basically, apps that target Android O have notification channels, but apps that aren't targeting O don't have them. 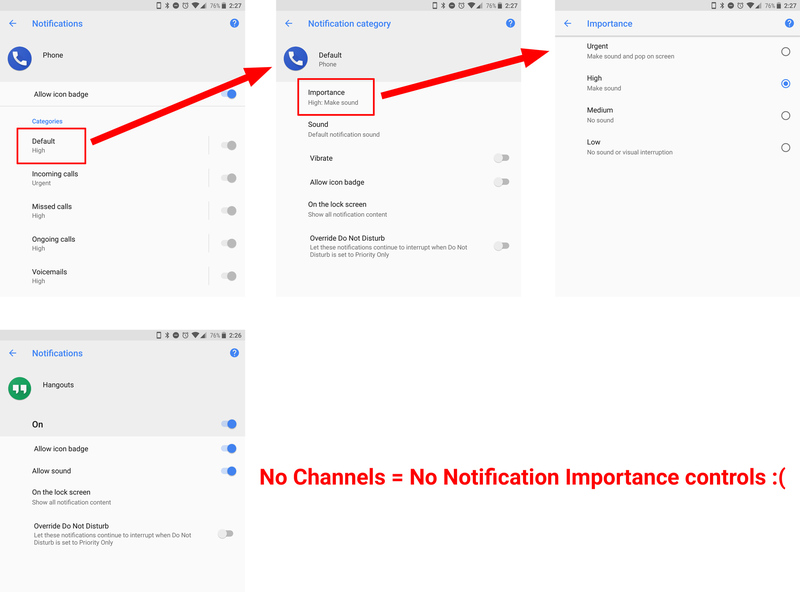 If there are no notification channels, there are no notification importance controls. That's what you can use to tell the system whether an app should make noise, show a banner, show an icon, or just be silent. Without channels in Android O, you just have none of these controls. The issue was starred 216 times, but Google has responded that the feature is working as intended and there's nothing to fix. It takes time for developers to update their apps for a new platform, so at launch most apps will lack importance controls on Android O. Bummer.